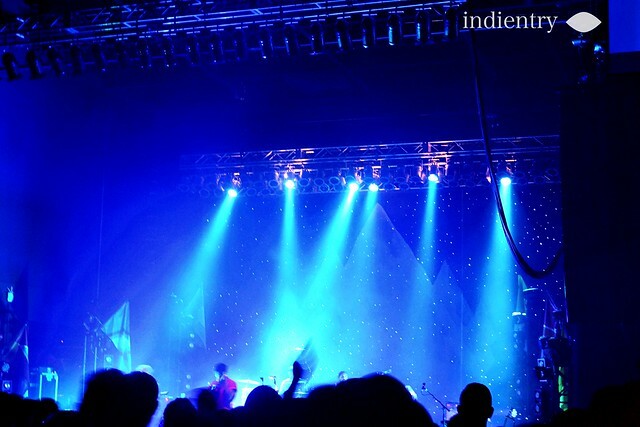 Despite the nasty weather, Young the Giant and Ra Ra Riot blew Columbus out of the water at the Express Live! Indoor venue on Saturday, September 10. Ra Ra Riot opened, and with their simple lighting production, there were few distractions from their talented sound. Wes Miles, the lead singer, strutted around during the slower songs, bounced more as they played faster songs, and showed off his vocal prowess in both low and high ranges. The band is a five-piece, featuring two strings players – a violinist (with a bedazzled violin!) and a cellist. Their energy was okay, although all five of them were moving in some way, the crowd was fairly mellow – despite the group of wasted guys in front of me who were going super hard – even though fans clearly enjoyed it. Although many of the audience members (including me!) hadn’t heard of Ra Ra Riot before the show, I heard many fans asking each other about the band – and I’ve definitely become a fan. After that, Young The Giant came on. They played 12 songs with an encore of three (see their setlist here!). Immediately, within seconds of taking the stage, it was clear that they’re a powerful band. Their set was easy to dance to, and the crowd moved as one while lead singer Sameer Gadhia bopped around onstage and twirled the mic stand. The band’s energy translated easily to the crowd, even on their slower songs, and the connection between the fans and the musicians was clear to see. The lighting production helped as well, because it was much more intricate and aided in the “cool factor” of the set. I couldn’t help but dance along. To put it simply, it was awesome, especially Mind Over Matter and Cough Syrup. Titus Was Born was mellow, especially with the gorgeous starry background. Gadhia’s thrashing around onstage while he sang was almost infectious, and looking back on it, the show seems almost like a dream. Absolutely incredible. If you get the chance, definitely go see these guys. I can’t stress enough how awesome that show was. Super high-energy, great band, cool lighting/production… Definitely a show that I won’t be forgetting about any time soon. Go see them! Thanks for this, I passed on this tour and now regret it 😦 Ra Ra Riot’s “Water” was one of the coolest most infectious tunes I’ve ever heard.